One of my most favourite features in Lamplight is groups. I’ve just finished setting up Lamplight for a CVS and the thrill I got from creating some automatic groups was, quite frankly, unnatural. I wonder from time to time how many organisations are getting the most from their groups? To scoot back a few steps, what on earth are ‘groups’? If you’re already using Lamplight then you might find they’re called ‘lists’ or ‘mailing lists’ on your main menu. When Lamplight comes ‘out of the box’ we call them groups and they’re a way to group together different people and/ or organisation profiles. You can create groups manually by adding profiles one at a time or automatically, based on criteria. Whatever information you’re capturing about people and/ or organisations (legal structure, services, dietary requirements etc.) then you can create an automatic list based on it. The beauty of these automatic lists is that if a person or organisation is added to the system and they match your criteria they will get added to your group(s) without you having to do a thing. That’s one of the things I love most about the groups, that all the work is in completing their profiles and capturing the interactions you have with them. The automatic groups just look after themselves! Below is an example of some of the groups we’ve got set up on our demo version of Lamplight. Focusing on the group called ‘Homeless as a Support Need’, we’re saying that this is for people that have a current support need listed as ‘Homeless’. My groups are just a list of people and organistions, now what? Groups are just the first step in doing more with your data. You’re right that they’re just a list of profiles, whether you’ve created them manually or automatically. What you really need is some way of viewing information about those profiles. That’s where ‘data views‘ come in. Data views allow you to specify which data you see about your profiles. If it’s in their profile then you can see it. 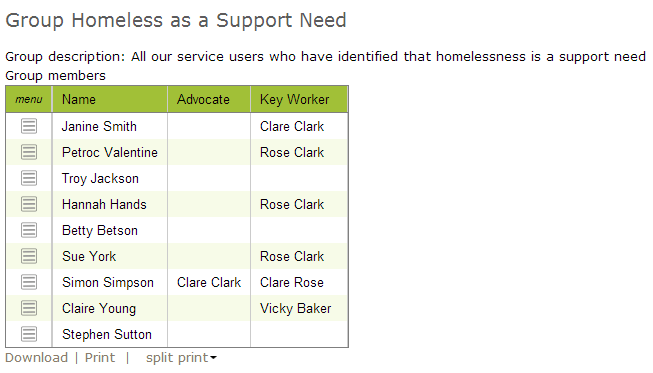 When a data view (in this case ‘Key staff’) is applied to a group (in this case ‘Homeless as a support need’) you get a table showing the names of their advocate and key worker. It could as easily be showing you their dietary requirements or mobile phone number. There are lots of ways you can use your groups and data views on Lamplight. Ways that will make life a bit easier and give you extra insight into the people you work with and work you do. When you’re arranging your AGM, create a data view of dietary requirements and mobile phone numbers and apply it to your group of trustees. When you hear about a piece of funding for youth organisations in your town, create an automatic group of all organisations working with young people and then email them with details of the funding. When you’re setting up your AGM, rather than adding each attendee separately to the work record, start typing in the name of the trustees group and they will all get added in one go. On this list of groups you will see there is a column for group size. If you are regularly asked how many BME groups you are working with or how many trustees you have access to then create an automatic group based on that criteria and then just run the group and read off the group size. Within your personal settings you can choose to apply a data view on profiles. This will give you a new tab at the front of all profiles picking out the information that’s important to you. You can filter your reports by any of your groups. If you happen to have funding to work with people from BME communities, create an automatic group for all people that match that criteria and then run your report. Why not give it a try. 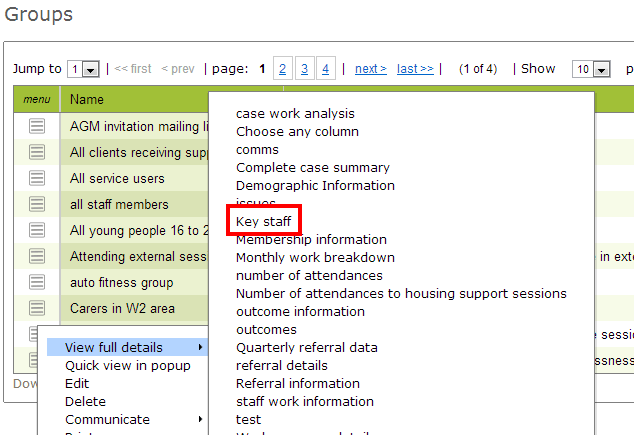 There is lots of information about creating and using groups and data views in section 14 of your online help manual. If you’d like to explore ways to get more out of your groups then we’re running an open training session in London on 28th February. Another session in Sheffield will be confirmed soon.